3D graphics technology is being widely developed. Not only used for the benefit of the film in theaters, but this technology began sweeping the LCD monitor even get to the laptop monitor already support 3D graphics. One of them you can see from the following Fujitsu products output. 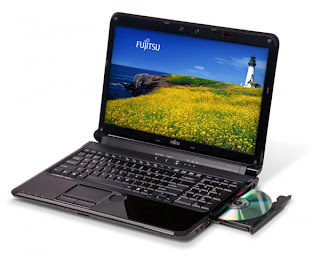 Fujitsu back teeth with the launch laptop LifeBook AH572, which is touted to have 3D graphics capabilities. With a 15.6-inch screen size and toughness bundled with Intel's Sandy Bridge processor Core i series second generation (I5-2410M), this laptop has a memory capacity of 4GB (8GB maximum) DDR3, 500GB hardisk own and already uses Intel's integrated graphics HD 3000. 3D graphics capabilities that owned the laptop is powered by the 3D technology XPOL filter, Blu-ray drive with Blu-ray 3D support. Coupled with the existence of dual 1.3 Megapixel camera that can be used to take pictures and record video in 3D format. 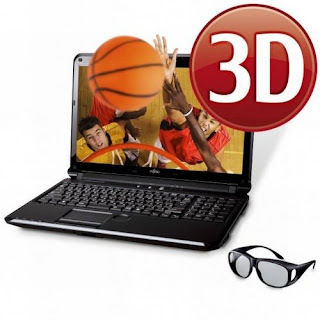 To be able to see the display of 3D on the screen, this laptop is also equipped with 3D glasses. Then how it seems with this 3D laptop network connectivity? LifeBook AH572 is equipped with Bluetooth and Wi-Fi with Wireless Display technology (Widi). Other features in it that you can find the HDMI, USB 3.0 port and SD memory card slot. With a separate keyboard with a numeric keyboard with 10 alphabet keys, the keyboard is also anti-spill water. So you can drink coffee while playing a laptop without fear of spilling your coffee on the keyboard of this laptop. With the battery 6-cell lithium-ion batteries, laptop Fujitsu LifeBook AAH572 is reportedly priced with a range of prices around 999 USD (about 10 million rupiah). Well, you're interested in having this 3D laptop?